Today, we are talking about sheet masks. 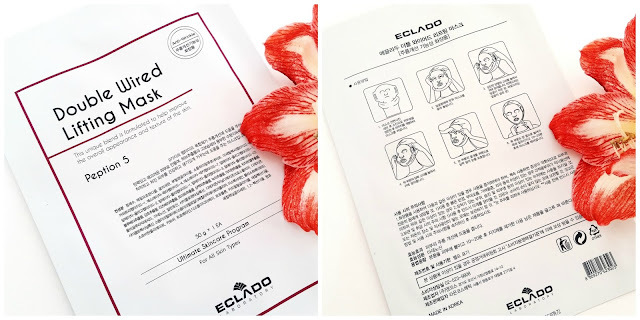 Specifically, these unique 3 in 1 face, jawline, and neck masks from Eclado. In all our years of masking, we have never tried anything like this before. While there are 2 in 1 masks with face and jawline or jawline and neck on the market, these are the first 3 in 1 sheet masks we have ever seen. 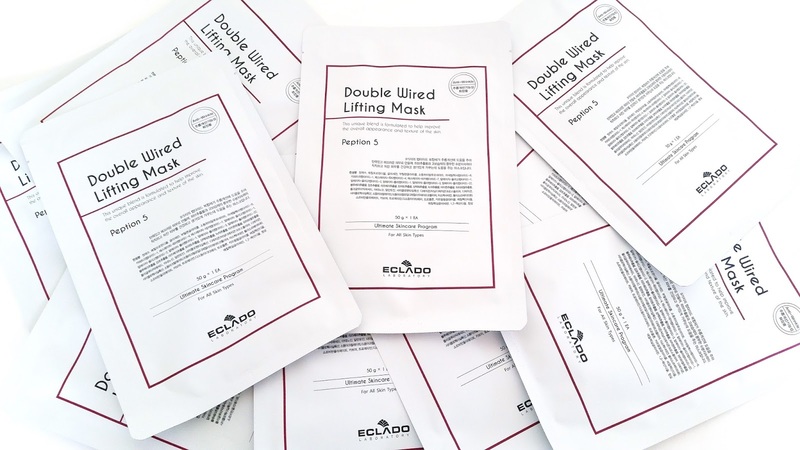 Needles to say, we were both pretty excited to try these Eclado Double Wired Lifting Masks. Let's get to know them! Eclado is the company behind these unique masks. Their name comes from a combination of the French words éclat and doux, which means shine and soft respectively. The company was founded in 1998 and they preach the value of 'blooming pride' which is their belief that healthy skin leads to radiant, beautiful, and youthful skin. Eclado follows that belief by continually researching for new and improved formulas to help your skin maintain its beauty and youthfulness. Eclado's products are all science based beauty solutions proven to work against its targeted concerns. 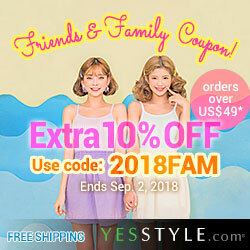 They offers a wide variety of products targeting different skin concerns, so there is something for everyone. Unlike its name suggests, there are no wires in the mask. Instead, the lifting effects comes from the ear hooks that pulls the mask and allows it to shape the face to create that desired lift effect. 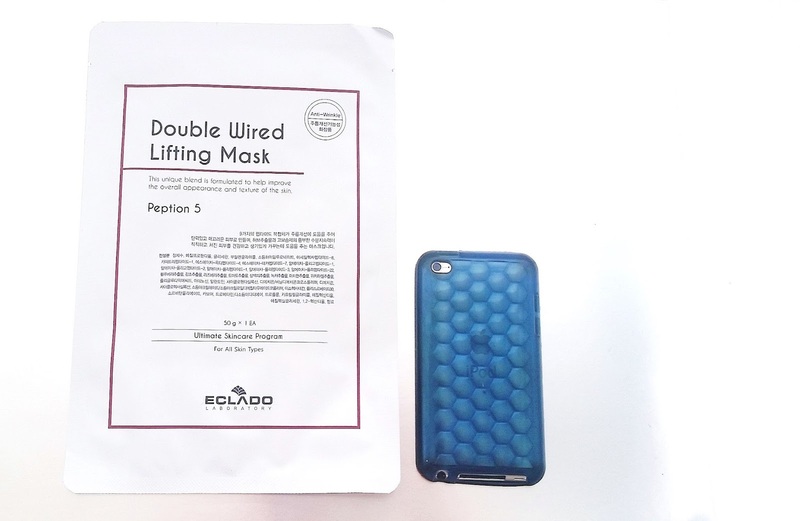 There are 3 different types of masks in the Double Wired Lifting Masks line. The one we are reviewing today is the Peption 5 mask. The line also offers Brightening masks and Soothing Plus masks as well. All 3 masks have the same design and they all provide the signature lifting effect. Product Description: Eclado Double Wired Lifting Peption 5 Masks are 3 in 1 sheet masks that includes a face mask, jaw mask, and neck mask. The mask's unique design allows it to provide a lifting effect along the jawline while hydrating the face, jaw, and neck areas. Peption 5 masks contains a variety of nourishing and anti-aging ingredients to give the skin that elasticity and firmness. These masks can also help to reduce the appearance of wrinkles and fine lines while providing the skin with moisturizing benefits. To Use: Cleanse and tone the skin. Place the face part of the mask on the skin first and hook the sides to the ears. Next, smooth the jaw mask along the jawline and hook it onto the ears. Finally, smooth the neck mask on the neck and relax for 10 to 20 minutes before removing and continuing with the rest of your skincare routine. Ingredients: Purified water, methylpropanediol, glycerin, butylene glycol, sodium hyaluronate, acetyl hexapeptide-8, copper tripeptide-1, SH-octapeptide-4, SH-decapeptide-7, RH-oligopeptide-1, RH-oligopeptide-2, RH-polypeptide-1, RH-polypeptide-3, RH-polypeptide-22, blueberry extract, licorice extract, raspberry extract, tomato extract, eucalyptus extract, green tea extract, portulaca oleracea extract, witch hazel extract, polyglutamic acid, adenosine, allantoin, cyclopentasiloxane, dimethicone/vinyl dimethicone crosspolymer, dimethicone, cyclohexasiloxane, sodium acrylate/sodium acryloyldimethyl taurate copolymer, isohexadecane, polysorbate 80, sorbitan oleate, carbomer, tromethamine, disodium, tropolone, caprylic glycol, ethylhexanediol, ethylhexyglycerin, 1,2 hexanediol, fragrance. 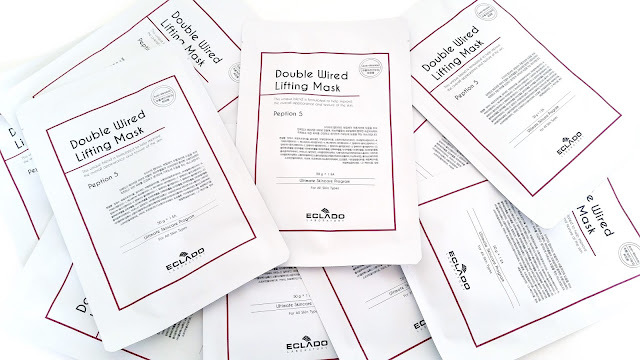 Notable ingredients: There are some amazing anti-aging ingredients in these masks. Most notably are the EGF ingredients as they are known to inhibit wrinkles, delay aging, moisturize the skin, and boost and regulate cell growth. These masks also include antioxidant ingredients such as green tea, anti-inflammatory ingredients such as licorice and a lot of nourishing extracts such as bluebery, raspberry, tomato, and eucalyptus. Packaging: The packaging is plain and simple. There is not much information in English, as most of it are in Korean. However, the mask packaging does come with picture instructions that are pretty straight forward. It also comes with the full ingredient list in Korean which we translated (along with other information) for you guys above. The sheet mask itself comes folded with no protective layers. It can be a little difficult to unfold the mask, however, since it uses a sturdy material you do not have to worry about ripping it. Scent: A mild, sweet floral scent with a hint of fruity notes. The scent is a bit perfume like but it is not overwhelming. 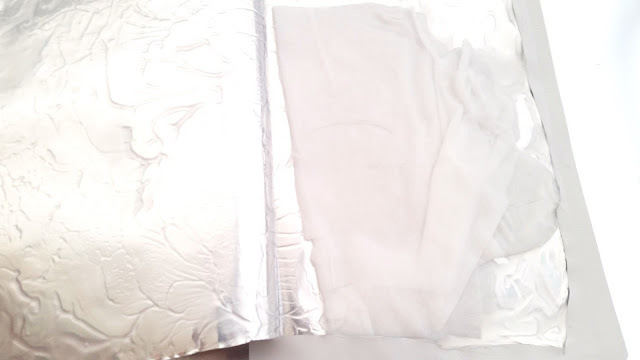 Color: The mask sheet is white and the serum is colorless but a little opaque. Texture: As you can see in the picture below, the mask serum is not runny but not super thick either. Its texture actually reminds us a little of the Water Gel but more fluid and watery. The mask serum is easy to absorb and it feels nice on the skin. Helen's Thoughts: These are the perfect masks to relax with after a long day. It covers the face, jawline, and neck as well as the eyes as it has a flap for each eye area. I like to lay down, close my eyes (so I can cover them with the eye flaps) and relax with the mask on. Its soothing formula is calming and it might cause you to fall asleep. Which is exactly what happened to me the first time I used this mask. It was the best two hour nap though and I do not regret a thing. Before we get to the amazing benefits these Double Wired Lifting Peption 5 Masks has to offer, let us talk about the jawline area. This section was surprisingly effective at first as my jawline looked lifted after I removed the mask. However, within a few hours, that effect began to lessen and the 'lift' effect it offered was gone just like that. I had hoped that by using this mask over and over, the effect would last longer. However, a few masks in and the effect is still temporary. Disappointing, yes, but it is not the end of the world. Despite the jawline con, these masks are still great masks. Not only do they feel amazing and relaxing on the skin, but they also offer quite a few amazing skincare benefits as well. The most notable effects for me are its moisturizing, nourishing, and anti-aging benefits. The mask's moisturizing and nourishing benefits are no joke. These masks are formulated with a ton of beneficial ingredients which always leaves my skin feeling soft, moisturized, and smooth. They can also adds a healthy glow, nourish the skin, and brighten my skin a little as well. As for its anti-aging effects, so far these masks have managed to firm and add some elasticity back into my skin. It has also managed to reduce the appearance of some of my wrinkles and fine lines. Although, it is not a huge improvement and for me the effects so far have been more noticeable on my fine lines than my wrinkles. I have noticed that my crows feet wrinkles look a little less obvious than before. 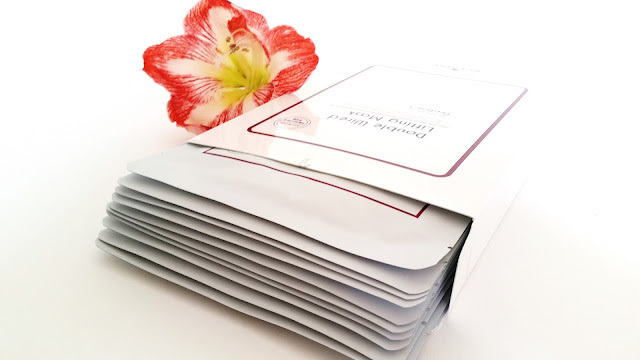 It is going to take a lot more uses to get better long term results, however, I hope that by using these mask in conjunction with other anti-aging products in my routine I can speed up the process and see better results sooner. 3 in 1 face, jaw, and neck mask with eye covers too. 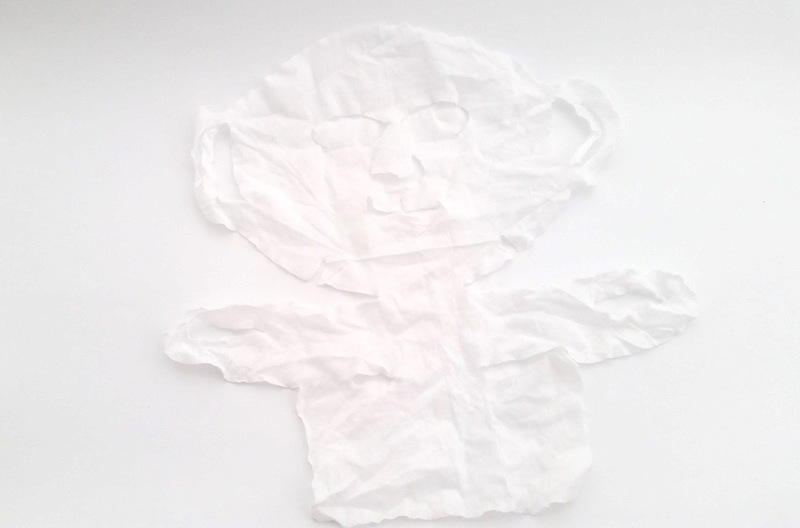 Michelle's Thoughts: As you guys know, I patch test everything (#SensitiveSkinIssues). Through my patch test I found that the serum can cause a slight warming/tingly sensation on my sensitive skin but it doesn't cause any negative reactions. That warming/tingly sensation usually only last the first 5 minutes and it hasn't cause me any issues. which is great. Applying these masks is a lot easier than it looks. Once you get the first set of hooks on (the ones on the side of the face), the rest comes easy. The overall mask fit was decent but it's lacking a bit for me in the jaw area (we'll talk about that later) and the nose area as the sides of my nose and the tip of my nose are not covered. The mouth hole is a bit small too, I didn't mind it covering my lips a little but it might not work well for everyone. The main issue I had with this mask was jawline part. I did nothing for me and I suspect it's because it wasn't tight enough. Unlike the side of the mask which came with 2 ear hooks each, so you can choose how tight you want the mask to be. The jawline part didn't have that option. So, for me, it just ended up hanging there and it wasn't tight at all. The mask still managed to provide moisture and nutrition to my jawline area but I didn't experience any of that 'lifting' effect. Other than that, I really like this 3 in 1 mask style. The design allows me to care for 3 areas at the same time which is great and saves time. Although the suggested wear time for these masks is 10 to 20 minutes, I actually like to wear them for at least 45 minutes. Since these masks are soaked with serum and even at around 45 minutes the mask is still pretty damp, so there's so need to waste. Plus, I get to enjoy the mask a little longer. 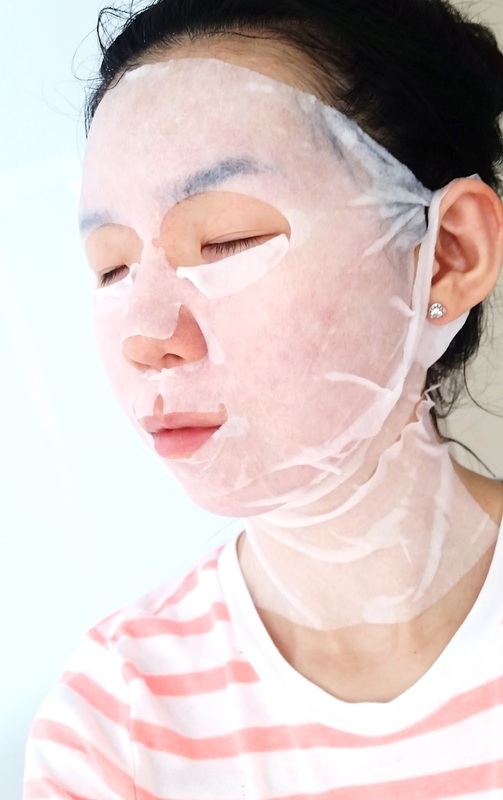 The Peption 5 mask's formula is super soothing and relaxing. I can see how my mom fell asleep with it on the first time she used it. Aside from its soothing and relaxing effects, these masks are also able to hydrate, soften, nourish, and plump my skin thanks to its amazing ingredients. I find my skin always looks a little brighter after I use the masks and it has a nice healthy glow to boot. I'm not sure how much I can say of the mask's anti-aging benefits because I don't really have any wrinkles yet. However, I do have a few fine lines here and there and man oh man did this mask help with those. I was surprised to see the results and while some of my fine lines did reappear after a while, others actually stayed gone. I'm going to keep using these masks to see if I can get better long term results. Oh, and I almost forgot. Although this mask doesn't claim to have these benefits, I actually found it to be able to lessen the redness on my skin (although temporarily) and calm some of the smaller pimples on my jawline. I know, not really a flattering sheet mask selfie but I wanted to show you guys what it looks like on the face with the hooks and all. Final Thoughts: It has been a while since we last did a review of a product together. (Did you guys enjoy our joint review? Should we do it more often?). Our results with these masks were pretty similar in some areas and we both like these masks despite its few cons. Honestly, the mask's unique 3 in 1 design and its soothing & nourishing formula are the main reasons why we love this mask. It is super relaxing and a great way to unwind after a long day. Would we purchase it in the future? Yes! The skincare benefits are pretty good with this mask and its impressive ingredient list is one of the reasons why we will get it again. We would also like to try the other two types of masks in the line as well. Do we think these are worth a try? Absolutely! 3 in 1 masks are relaxing and you get to care for your face, jawline, and neck all at the same time. It is something to experience if you have never tried a mask like this before. In our opinion, these are worth it. What do you guys think of this 3 in 1 mask design? Do you like it? Would you try it? Disclaimer: This product was sent to us for review purposes. All opinions are honest and our own.